Andrew Chiariglione was born December 24, 1879 in Hoboken. His family moved west to Pueblo, Colorado when he was a boy, and as soon as he was old enough he left school and went to work as a fireman for the city and also for the Denver & Rio Grande Railroad. At some point after the move, he was known as Andrew Haynes or Haymes. The strength and stamina he developed as a fireman served him well as an amateur boxer. A high percentage of boxing fans at the turn of the century were of Irish descent, so when Andrew began boxing as a professional in 1899, he took the ring name Fireman Jim Flynn. He stood just over 5’10” and weighed around 180 pounds. His manager was Tom McGrath, who was best known for developing Tom Sharkey. Jim began to make a name for himself among Rocky Mountain fight fans a few years later when he went 20 fights without a loss. In 1906, he earned a shot at the heavyweight title, fighting Tommy Burns in Los Angeles. It was a long, brutal fight that saw Jim hit the canvas four times. He was knocked out in the 15th round and had to be carried out of the ring. Referee Eddie Robinson later admitted he should have stopped the fight earlier in the 15th. One year later, Jim stepped into the ring with Jack Johnson in San Francisco. Johnson gave him a savage beating that ended with an 11th-round knockout. Jim was unconscious for four minutes. Jim scored a huge win in 1910 when he won a decision over heavyweight contender Sam Langford. In their rematch a month later, Langford won by a knockout. They had fought previously in 1908, with Langford winning. Jim’s first fight east of the Mississippi took place in 1911 against Carl Morris in Madison Square Garden. Morris towered over Jim, but he won a decision in 10 rounds. 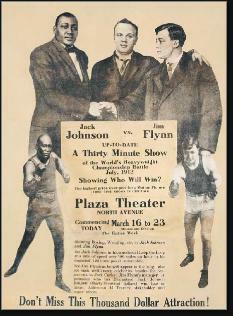 Jim got another title shot in 1912, in a rematch with Johnson. Johnson, an excellent defensive fighter, tied Jim up round after round. Jim cursed him and tried to break his clinches with head-butts. After watching Jim ignore the admonitions of the referee, the Sheriff of Las Vegas stepped into the ring and stopped the fight. He was later remembered as the first of the Great White Hopes to challenge Johnson. Jim was in his 30s during World War I, and did not enlist in the military. During the war years he did most of his fighting in the East and Midwest. However, on February 13, 1917, Jim fought what would turn out to be his most famous bout outside of Salt Lake City—against little-known Jack Dempsey. Dempsey would become heavyweight champion in 1919. Moments after the two fighters touched gloves to start the fight, Jim swept Dempsey’s guard away with his powerful right arm and an instant later crashed a left into his jaw. Dempsey sank to his knees and could not answer the 10-count. It was the first and last time he would be knocked out. Jim’s easy victory was viewed with immediate suspicion. Dempsey was making $50 a fight at the time and his family had debts all over Reno. Rumor had it that he was offered $500 to take a dive, and a fading “name” fighter like Fireman Jim Flynn would serve as a plausible opponent. Dempsey was persona non grata in Utah after that. But obviously he was headed for bigger and better things. Six months later, in a rematch in Illinois, Dempsey returned the favor by knocking out Jim a minute into the first round. Jim continued to box for eight more years. He continued to draw some of the sport’s best opponents, including Billy Miske, Carl Morris and Langford three more times. Each of the Langford fights was in Mexico and Jim lost them all. The final high point of Jim’s career came in 1923, when he defeated future middleweight champ Tiger Flowers. Flowers injured his hand in the fifth round and had to retire. It was Jim’s only victory in his last 11 bouts. He hung up his gloves in 1925 at age 45 with a record of 64–45 with 18 draws. Jim was credited with 51 knockouts. He continued to work as a firefighter throughout his boxing career. Jim tried to scratch out a living in Oklahoma and Arizona after his fighting days. He tried to become a policeman and also worked as a cab driver. He separated from his wife and son and his health began to deteriorate. He experienced vision and heart problems in the 1930s and died of a heart attack in 1935 in Los Angeles, where he was working in a bar.